ABT is coming to town! In addition to a seven-performance run of Swan Lake (yes! ), the New York-based troupe will present a one-night-only showcase of American choreographers. The All-American Celebration featuring works by Jerome Robbins, Paul Taylor and Twyla Tharp, is also the Chicago debut for 22-year-old soloist Daniil Simkin. This Russian-born wunderkind has exquisite technique, an inextinguishable creative curiosity and oodles of charm. Think of him as a mini Misha. 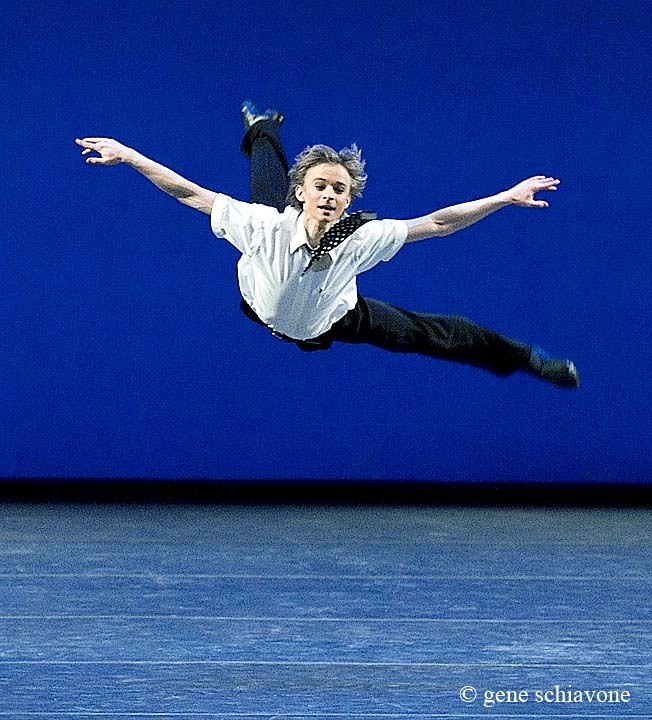 Daniil grew up in Germany with dancer parents Dmitrij Simkin and Olga Aleksandrova (his Mom was his teacher) and at age 6 made his stage debut alongside his father. Within 6 years, he began competing and collecting myriad awards including: Senior Gold Medal at the USA International Ballet Competition, (Jackson, 2006), Grand Prix International Competition (Helsinki, 2005) and First Prize and Gold Medal at the 21st International Ballet Competition (Varna, 2004). Not bad for a kid, huh? After dancing with the Vienna State Opera for a year he landed his first principal role (guest artist) as Basilio in Don Quixote with the Lithuanian National Opera in 2007. *Check out his Act II pas solo at min 5:50 and entrance for the coda at min 6:46. Since joining ABT as a soloist in 2008, he’s been racking up an impressive and ever-expanding rep including Company B, Allegro Brillante, the Son in Prodigal Son, Benvolio in Romeo and Juliet and now one of the three sailors in Jerome Robbins’ Fancy Free in which he is making his Chicago debut on Wednesday, April 14th. Not one to sit idle, the elfish phenom also travels the globe dancing in numerous galas throughout the year like the World Ballet Festival in Japan and Intensio in Athens where he is also the organizer. One thing that does make him stand out — besides his dancing — is his online following. A self-proclaimed tech nerd, Simkin is expanding his fan base via the internet. His presence can be found on MySpace, Facebook, Twitter and he has his own website. Videos of his virtuouso dancing on YouTube have received well over a million views. While some may think it an exercise in ego, he feels that it is more about information and demystifying the world of a ballet dancer. Other dancers are following this line of thinking (most notably in Chicago, Joffrey dancer Fabrice Calmels) according to this New York Times article. RB: Out of all the awards you’ve won, which one means the most to you and why? DS: It is hard for me to pinpoint a specific award since all of them were an equally important part of my growing up as a person and artist. The awards themselves do not really mean much; the important part for us, my mother and me, is having done all the work and being a part of the competition. We always saw competitions as an opportunity to prepare and improve new variations and movements and an opportunity for me to meet up with dance students my age. The awards were a welcome perk. RB: You are making your debut in Jerome Robbins’ Fancy Free. Tell us about your experience learning this iconic ABT piece. Do you enjoy dancing his style of choreography? DS: Indeed I have to say it is a blast to dance, but I am saying that NOW. Robbins’ style is very distinctive and includes many non-classical elements from tap and jazz. Coming from an almost only ballet background…it was hard for me to adapt to his style. Nevertheless, after many hours of rehearsals and the help from my ballet master Victor Barbee, I can say now that I feel very comfortable in it and it is just a delight to dance it. Besides, I have to say Fancy Free is part of ABT’s history and I feel honored to have the chance to be a little bit part of it! RB: What is your favorite role you’ve danced so far? What roles would you like to perform that you haven’t yet? DS: I have performed Basilio in Don Quixote many times abroad and it is a blast to dance. I think the role fits me currently, where I am in life and my character. It involves being genuinely happy with and in yourself and to just dance your heart out! I would also love to perform Albrecht in Giselle someday. This tragic role involves a lot of acting and deep inner emotions with a lot of drama, which I would like to explore and hope that I can manage to do that in the future. RB: You’re pretty tech savvy. How do you think your online presence has helped in developing a broader fan base? Are any of your fellow ABT dancers following your lead? DS: I would say that my online presence helped me tremendously to extend my popularity! I think that I was simply at the right place at the right time when I uploaded my first clips onto YouTube when (it) first launched. It is a new and exciting way of communication! I honestly think that this is just the beginning. There is a lot of unused potential in the way you can engage and reach your audience. Many of my fellow colleagues are experimenting and trying new ways of communication – most of them are on Facebook, many are tweeting and I encourage any curiosity expressed by my colleagues. RB: You’ve accomplished so much already at 22 – where do you see yourself in ten years? Do you have any personal goals set? DS: I have to say that I was recently quite influenced by Eckhart Tolle’s book The Power of Now. I try to stop myself from thinking too far ahead and setting too many goals. I live in the here and now and that is what I am enjoying most. I work hard a try to be the best I can be and, in the meantime, enjoy the ride. What will be will be, especially in ten years. RB: What’s your favorite dance step? DS: I love any movement of the human body, since it is hard to define the border of what exactly a dance step is. RB: What do you like to do on a day off? DS: I love the Internet and anything involving tech or in general gadgets. Some guys are drawn towards engines, cars and planes, whereas I have always been drawn towards anything with a display. I also love being around my friends and generally meeting and socializing with new people. Besides that I love the arts, especially visual art like movies, photography, graphic art or computer games, which involve me in a passive way. Most of the time, I am so physically exhausted that during my off-time I like to be entertained without exerting too much physical energy. RB: If you were a super hero, what would your super power be? DS: I would be called the HappyMan, and my super power would be that whoever looks at me would become instantly happy for a short time. This entry was posted in Uncategorized by Vicki. Bookmark the permalink. I jsut did an interview with Daniil too — what fun! Check it out on my website! Take care and happy dancing! Daniil posted it on his Twitter page and I read it today. Great interview! Way more fun than mine – and you had cookies! I’ll put a link to your blog on mine.